Two Senate Democrats have sponsored a bill demanding the White House reveal the terms of the Trans-Pacific Partnership (TPP) to the public at least two months before Congress could give President Obama fast-track authority. 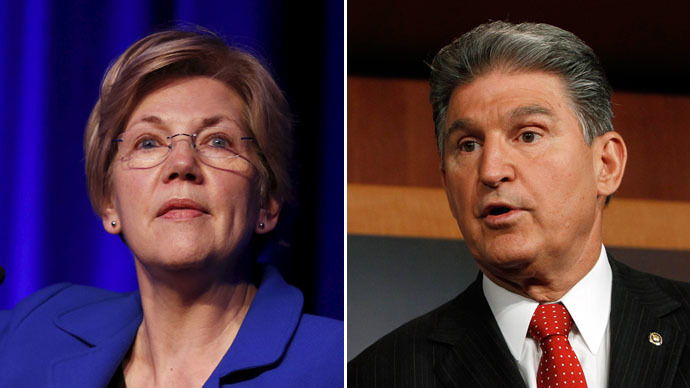 Joe Manchin of West Virginia joined Elizabeth Warren of Massachusetts in proposing the two-page Trade Transparency Act, reports The Hill. If adopted, the bill would require the White House release the “scrubbed bracketed text of any trade agreement” no less than 60 days prior to a vote in Congress on fast-tracking the treaty. Warren has been an outspoken critic of the TPP and other free trade agreements, releasing a report on Monday laying out two decades of “broken promises” by successive administrations when it came to free trade treaties. Obama himself stepped up to champion the deal, firing back at Warren by calling her “a politician like everybody else” whose arguments “don't stand the test of fact and scrutiny." The administration has also maintained that the treaty is still being negotiated, and that fast-track authority was needed to finalize the talks. A senior adviser at the National Economic Council argued that publicly announcing the details of the deal would be harmful to US interests. Obama himself has shrugged off comparisons with other free trade deals. “You need to tell me what’s wrong with this trade agreement, not one that was passed 25 years ago,” he told the Organizing for America conference in April. Michael Wessel, a former Obama campaign adviser and one of the people cleared for access to TPP drafts, says that specific criticism is impossible, though. Anyone who has read the text of the agreement could be jailed for disclosing its contents, he wrote in Politico. Congress is currently considering a bill giving the White House fast-track authority to negotiate the TPP, a trade pact that would include 11 Pacific Rim countries, notably excluding China. Warren and Manchin maintain that keeping the details of the agreement classified makes it impossible for legislators to amend the treaty, and difficult to block its final approval.